New data from TiVo seems to undermine the opportunity for ad-support VOD services online. Does this mean Hulu was right to dump free-ad-supported content? TiVo asked survey participants “if Netflix or Hulu offered a FREE TV service, but you were required to watch commercials, would you consider using it?” This question is a little ironic, since Hulu was born as a free TV service and only eliminated the last vestiges of free ad-supported content last quarter. That said, 69.4% said they would watch commercials if the service was free. Many of those that would watch ads don’t want to see too many of them. 71% said they would tolerate 3 commercial or less per 30 minutes. 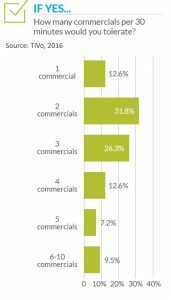 Conversely, just 17% said they would watch 5 commercials or more during the same 30-minute period. Hulu shows more than 5 ads per 30 minutes of viewing, as does Crackle. Interestingly, of the 30.6% that said they would not watch an ad-supported service, 14% said they would change their mind if the ads were more relevant to them. Tivo data suggests the majority of SVOD users are still only paying for one service. Those spending less than $11 a month are likely only taking one service. 60% said they spent less than $11 in Q3 2014, and 53.4% said this in Q3 2016. Those spending more than $11 a month on SVOD may be taking more than service. The numbers here have increased from 40% to 46% in the last two years. Those spending over $21 a month are very likely to be taking 2 or possibly three service. These numbers have increased from 6.8% two years ago to 10.7% today. These numbers, however, suggest there is resistance to taking more than two SVOD services. Over the last two years, the number of SVOD services available has grown from less than 10 in 2014, to around 100 today. A huge array of SVOD services delivering everything from Broadway theater to science documentaries have come to market. In light of these numbers, it’s a little surprising there aren’t more multi-service households. TiVo suggests that its data supports Hulu’s decision to sunset free-ad-supported video at the site. Since it shows more than 4 ads per 30 minutes, and survey participants said they didn’t want to watch that many, TiVo argues Hulu couldn’t make money from such an ad load. I do not agree with this conclusion. In the past, I estimated the amount of Hulu revenue made from advertising exceeds the subscription revenue. This seems to indicate that subscribers to Hulu are willing both to pay $8 a month for the service, and watch more than 4 ads per 30 minutes. Though Hulu does not publish how many people have taken the $4 option to watch ad free, it’s likely that most of the 12M Hulu subscribers are still watching ads. Hulu’s performance suggests consumers are willing to get over their antipathy for ads if the content is good enough. 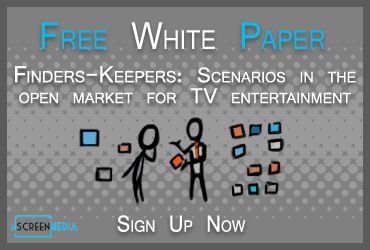 There seems to be consumer resistance to taking multiple SVOD services. That could mean there is an excellent opportunity for ad-supported content to augment SVOD services. And at ad loads above the 4 per 30 minutes indicated by TiVo’s research. TiVo data suggests resistance to taking more than one or two SVOD services. The data also shows many people willing to consider an ad-free service, though at very low ad loads. Hulu’s performance suggests people are willing to get over their reluctance to watch ads if the content is good enough. This is a fascinating survey. A consumer survey is also probably not the sharpest way to go at this question and I’m surprised TiVo released this survey. I’d love to get better sourcing on it Colin. After all, it matters a great deal how good the ad creative is and how frequent and obnoxious the interruption is, so survey respondents really must’ve had very different conceptions of what question means. It doesn’t seem like a good consumer survey question to me. Colin, what this says to me, is what I have believed for a long time. Hybrid models (small consumer pays, with lower, and more targeted ad loads) are not only desirable to the consumer, they offer multiple revenue sources for the media publisher. This also provides a laboratory environment for how to strike the balance in these hybrid models (how much of a “small” monthly fee for a commercial load of 5 commercials or less per 30 minutes of viewing.